Yes, I did just quote Tropic Thunder. I still find the fake 'Simple Jack' trailer one of the funniest things ever. As much as I'd like to sit here and talk to you about why Robert Downey Jr is the best at being an American playing an Australian playing a black dude etc etc, that won't be the case tonight. No. It's gloomy outside, the polar blast is still lurking around New Zealand (but no snow for Dannevirke...grrrrrrrrrrrr), and I'm feeling a bit under the weather. So I thought I better write a happy post! You know, there are rarely any moments when I watch movies just to be happy. Usually I just stick a movie in and there you have it (I shall be watching Biutiful later tonight, which doesn't look like it will be a happy ride at all). If I had a type, I definitely do like watching movies which make me cry or really sad. But there are some movies which just make me happy. They make me smile like an idiot at the end, even if they aren't jovial right the way through. At the moment, everybody seems to hate romantic comedies. Which is probably a good thing, considering that 99% of them are a load of crap and watching two people being in love isn't as interesting as it was back in the days of Katharine Hepburn and Spencer Tracy. But you know one pretty recent romantic comedy that is actually awesome? (500) Days of Summer. Okay, so maybe it's more of an anti-romantic comedy, but either way, it still speaks the truth about many relationships and why they sometimes don't work out. While I wished that Tom and Summer could have been together at the end, I'm always smiling ear to ear once the credits roll. That's probably because this film, after all the depression that Tom goes through after being dumped by Summer, takes one last stab at happiness right at the very end. It comes in both the form of Tom finally realising that there are more things in life than the love of Summer Finn, and a very clever inside joke between the viewer and the film. I'll admit, I'm secretly a hopeless romantic. You know, one day, I'd love a guy like Tom Hansen. Yet, another reason why I love (500) Days of Summer is the fact that it is so coy about love, as it's essentially about learning that love isn't the fairytale it seems to be. That's what really makes me happy. Yes, the film looks at a romantic relationship between a man and a woman. But in this one, Katherine Heigl doesn't get the guy who she really hated at the beginning. Instead, we see love happen. It may not be true love, but it's there. Then, we see the ultimate heartbreak through the brilliant expectations/reality scene, as Tom's fantasy falls down around his ears by seeing what actually happens. Yeah, reality will always be there to make sure that we don't live our lives through a fantasy. This is when I feel pretty sad for the guy, which makes the end all the more happy. And while Tom spends most of his post-Summer days in a state of depression, when he finally meets Summer again, he was able to take it like a man. (500) Days of Summer may have it's twee glossy coat, but really, there's a world of depression and sadness underneath it all. But it still manages to make me smile in the end. Like I did with (500) Days of Summer, I can usually find happiness in the most unlikely films. For example, I always feel really happy when I finish watching Let the Right One In. This film, to me, is one of the most beautiful portrayals of friendship in a film. It features two outcasts, one being a young bullied boy and another being a young vampire who has lived for hundreds of years. Sure, it's unlikely, but this movie is essentially an allegory for having a friend who will always be there for you. My heart always shatters when I see the note Eli wrote - "I must be gone and live, or stay and die" - because this means that poor little Oskar has no-one yet again. But every time I see that amazing swimming pool scene, I'm instantly lifted. I think the bond between Eli and Oskar is so sweet, especially because of how Eli could help Oskar when he was in so much trouble. The final scene, showing Oskar in the train using morse code to communicate with Eli who is in a box, always makes me happy. Mainly because I love how they can help each other so effortlessly, whereas before they met each other, they were struggling to help themselves. There are plenty of other weird movies that make me really happy (seriously, Inglourious Basterds will never fail to make me smile like someone on drugs). Oh yeah, and there are movies which make me happy once they finally end (uh, Sucker Punch, anyone?). But hey, I'm strange like that. What are some movies which make you happy? This is a lovely topic. Okay, the first time round I saw 500 Days of Summer, I got so depressed. Like I dunno why, but I was Tom Hansen without ever having been in that position you know. Films that make me happy- anything Edgar Wright, The Hangover (especially before a math exam), Nick and Norah's Infinite Playlist...actually anything Michael Cera, The Boat that Rocked, Easy A, Igby Goes Down...any new film, but they have the possibility of going the 500 Days way. 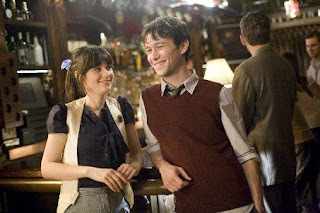 (500) Days of Summer rocked my world! Indeed the best romantic comedy in years. You're not strange. I have the same affliction of smiling during inappropriate times in movies. It happens. I, too, have a preference for more depressing films (as evidenced by my obsession with Lars Von Trier and Michael Haneke, who've made the most depressing films I've ever seen). It's just part of my nature, I like being depressed! Am I crazy or what? Nikhat - I got pretty depressed by 500 Days of Summer, but the more I saw it, the happier I became about it all. Aw, those films make me happy, too! I watch The Hangover a lot before big moments...like before getting my tonsils out, which made me less worried. Tyler - It does happen. And no, you aren't crazy! I really like depressing movies. They usually mean a lot more than the happy ones. To me, anyway. Yay, my first answer would be Inglorious Basterds. And I thought I'm the only one person who gets a good mood after watching this movie. Others would be 10 Things I Hate About You, It Happened One Night, Bringing Up Baby, and probably many other old films. Haha, I'm also glad I'm not the only one! Those are very good choices too!